How cute are these itty bitty witty bugs?! These little guys are full of character and they are great for those projects where you don't have a lot of space to work with but you just want to get that message in! You can also sneak them into anything and the bonus is that they are so funny! 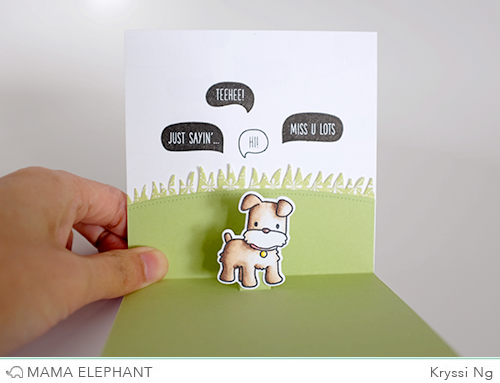 Make your die cut, stamped images pop out of their card with these Pop-Up Trio Creative cuts! This set includes 3 different dies varying in length. Angela made a story board card with the tiny fellas from Small Talk! 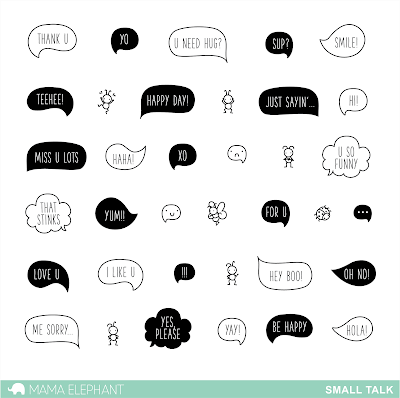 How fun are these small speech bubbles? 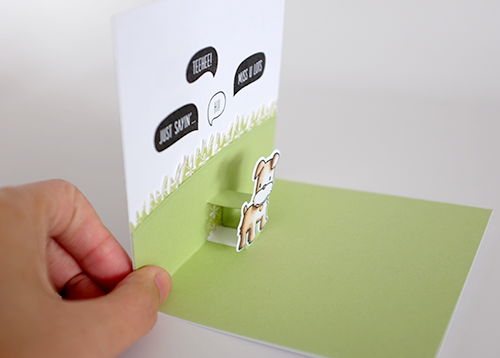 Kryssi put together a fun Pop-Up 3D card by using the Playful Pups creative cuts and the Pop-Up Trio creative cut. Thanks for joining us these last few days while we introduced our new May sets! Please come back tomorrow as we will stampede through more projects! We will also be introducing a new member to the Design Team, so stay tuned! My word, these are just adorable! Hoping they make it to the UK as soon as possible after the release! Adorable! Who needs food? I need more stamps and dies. I love these. so totally CUTE.. i love the small talk that is just too fun.. The little sayings are great. So often the saying doesn't fit after you add your other designs. These will be wonderful. Love the pop-up die - one less step of measuring and cutting that we have to do. The Pop Up Dies are brilliant. Such a simple solution! Oh my gosh! What an adorable stamp set!! And the pop-up die is so cool! Haha, this set is really funny... Many many speech bubble cards to make! I just love the small Talk stamp set. It is absolutely adorable. Love the cards. Thanks for sharing. Love the pop out ideas! OMGosh these itty bitty characters with speech bubbles are sooo cute. Is there a video showing how to use that pop up die? ?